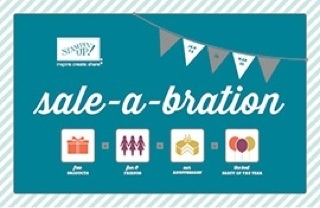 So what products from Sale-a-Bration do you like getting for FREE the most (with $50 order) - stamp sets, a punch, a pack of designer paper, accessories pack or My Digital Studio downloads pack? Maybe I should ask, did you know you could get those for free? Hmmm... I pick DSP, then MDS downloads. I will always pick consumables like paper and ribbon and such and get them for FREE. Dude - Go Build Something!